La Recoleta Cemetery (Cementerio de la Recoleta) is the 6th most beautiful world’s cemetery according to Bloomberg (Père Lachaise is still number three, hehe). 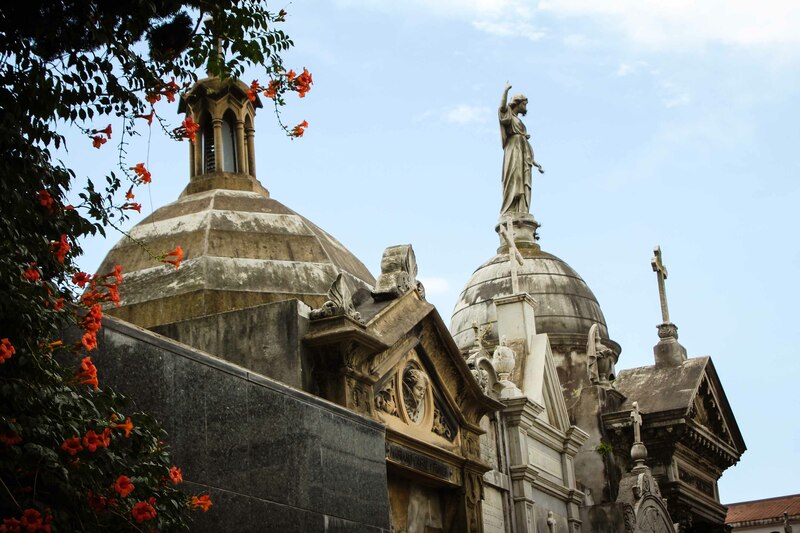 All gorgeous, filled with masterpieces ranging from Baroque to Art Deco to Art Nouveau to Neo-Gothic, and carefully tucked in the middle of the city, of course, La Recoleta has never been meant as a place where simple people rest. Designed by French engineer Próspero Catelin for rich and famous, it mimics the architecture of their Earth homes (in fact, the nowadays houses around La Recoleta fade in comparison to the cemetery). Once an orchard of the monks’ convent, the cemetery now contains 4691 vaults, of which 94 have been declared National Historical Monuments and are protected by the state. Many famous people are buried here: think Eva Perón (the famous First Lady of Argentina best known as Evita), Argentinian presidents, Nobel Prize winner Luis F. Leloir, the founder of the Argentine Navy, and even grand daughter of Napoleon Isabel Walewski Colonna. The grand daughter’s story is quiet sad (you are not expecting any fun at the cemetery, are you): she was only 6 days old when she died – but already baptized. She was then buried in the family tomb of her godmother, María Sánchez de Mendevielle. The most famous tomb story though (ok, it does start to feel like a cemetery) is not about someone famous. Rufina Cambacérès died in 1902, when she was nineteen years old. Or, to be more precise, she was pronounced dead by three doctors, all of which turned out to be wrong. Rufina woke up in her tomb, buried, and tried to set herself free. The cemetery servant found her coffin moved the day after the service, opened it and discovered Rufina dead (for real now), her forehead and hands all in bruises from the attempts to break free. Or maybe it is all an urban legend. The cat would probably know, but would the cat tell?. Well, Argentina was one of the world’s most wealthy countries in the late 1800s and early 20th century. So these tombs come from those times! I think I am good for cemeteries for another decade 😀 I would love to come to Manila (and SE Asia in general) and explore it for other reasons. Wow- it almost looks like a small town within a city, those tombs are enormous and so ornate. Sometimes I find it can be quite peaceful wandering through cemeteries, but definitely not after dark – I had a friend whose house overlooked a graveyard, and she always used to think it’d be great fun to walk through it at night. Unsurprisingly, I thought otherwise! Mmm, I definitely see why. Ahaha, the black hen avatar absolutely rocks! Thanks for your kind words. I m share your general idea about the cemeteries.. but this one is so wonderful… it looks more like a museum full of biographies, stories, legends….